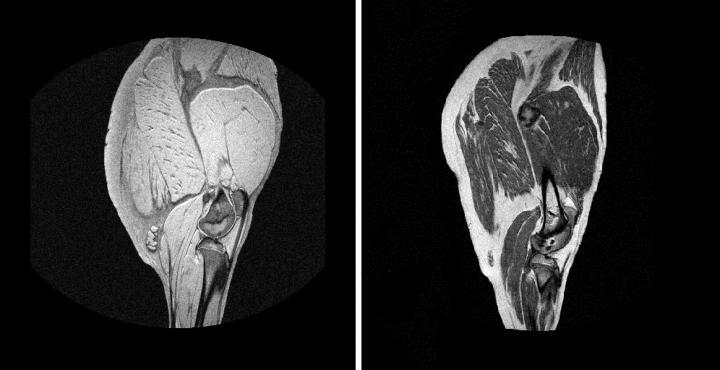 Researchers from the University of Extremadura (Spain) have developed a methodology that allows us to know the properties of hams and whole loins using magnetic resonance imaging, the same non-invasive technique used in medicine. The method has already been made available to the meat industry. Magnetic resonance imaging (MRI) is commonly used in medicine to look at organs and structures inside the human body. Now researchers from IProCar – the Meat and Meat Products Institute – of the University of Extremadura have applied this same technology, based on the non-invasive use of magnets and radio waves, for something very different: to know the characteristics of Iberian hams and loins without need to destroy them. Once the images are taken, the scientists analyze them with computer vision algorithms and extract numerical values on which, in turn, they apply statistical methods. In this way, the quality characteristics of meat products can be predicted. "The technique allows knowing parameters such as the amount of fat, moisture, color and some sensory attributes of the product; and in the case of ham, also monitoring the salt diffusion during the different stages of the maturation process," explains Trinidad Pérez Palacios, a member of IProCar. The studies carried out with this methodology have been published in several scientific journals, such as the Journal of Food Engineering, where this year Extremadura researchers have presented a paper focused on the application of texture algorithms to three-dimensional MRI images to predict the quality of the loins. According to the authors, the combined MRI-computer vision technology is an alternative to the destructive quality control methods currently used, as well as offering results in almost real time. "We put at the disposal of the meat industry an effective method to obtain images of any meat piece – not only loins and hams – in a harmless and non-invasive way, allowing, in addition, its subsequent commercialization," Pérez Palacios points out, concluding: "Its implementation in the meat industry is only a matter of time."